When it comes to kitchen remodeling, there are many things that you will need to consider before the project is done. One of the most important is going to be what type of lighting you want. Without proper lighting, the whole room will have an unpleasant feel, and it will be difficult to see what you are doing when cooking. Read through some of these popular lighting options for modern kitchen renovation projects. Hanging orbs are a great option for just about any area of the kitchen. This design has a cord hanging from the ceiling with a glass orb at the end containing the light bulb. You can have the cord as long or short as needed to meet your design. The orb can also be larger or small based on your preferences. You can even have the cord be adjustable so that you can change the location of the light as needed. Placing lights under your cupboards is a great way to ensure the area where you are doing most of the work for cooking is properly illuminated. These lights are usually long and flat so that they aren’t seen unless they are turned on. New LED lighting fixtures are perfect for this area since they are long lasting, quite flat, and provide lots of light. You don’t need to choose identical lighting fixtures for a given area. If you want to have four lights over your kitchen island, for example, it often looks great to choose four unique designs. When doing this, it is often best to have one thing in common across all of them, however, to ensure they match nicely. For example, having four different designs that are all black on the outside can look very distinguished. Chandeliers really never go out of style when it comes to lighting up an area, and that is certainly true when looking in the kitchen. There are hundreds of different design options when it comes to a kitchen chandelier, so you are sure to find one you love. Just make sure that it doesn’t hang down to far that it will get in the way of people walking or seeing each other over the table. Having the light fixtures hidden away as part of the décor can be a very beautiful way to light up the room. These lights can shine up toward the ceiling where it will be dispersed throughout the room nicely. There are many different hidden light fixtures you can choose from, and they can be positioned throughout the room for even lighting. No matter what type of lighting you need in your kitchen, we can get it all set up for you. 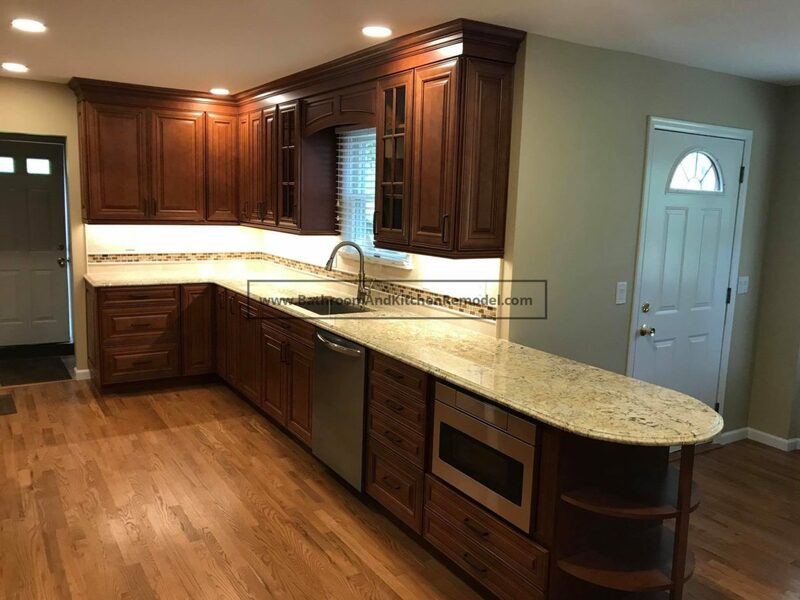 Whether you are having your entire kitchen remodeled, or you are just looking to replace the lighting, we will be there for you. To learn more, or to get an estimate, please give us a call at (631)-836-7579.